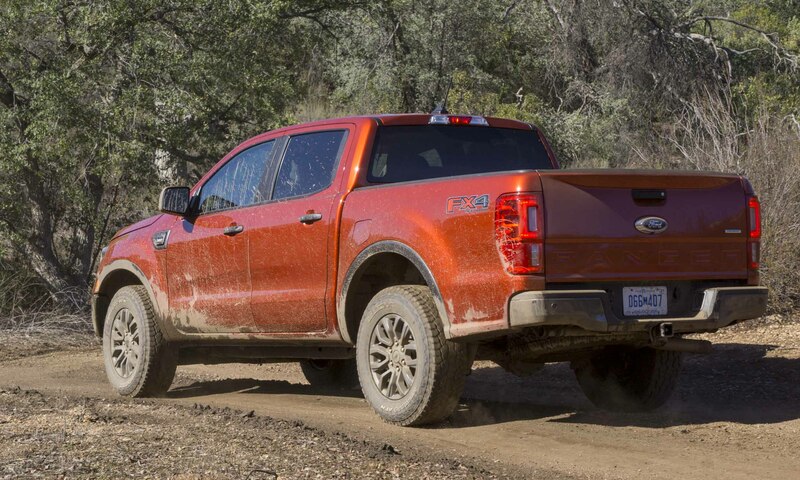 Eight years ago Ford exited the midsize truck market, cancelling production of its still-popular Ranger. 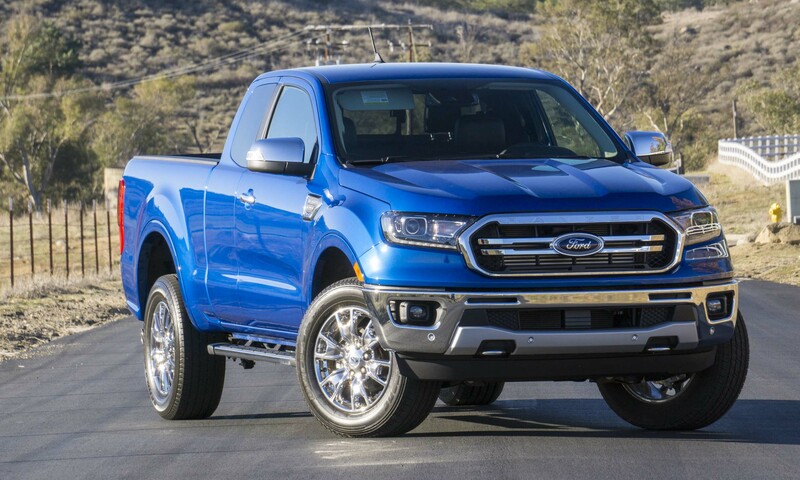 Since that time, the midsize truck market has grown with new models such as the redesigned Toyota Tacoma and all-new Chevrolet Colorado, so Ford deemed it the right time to make a U.S. return with an all-new Ranger. 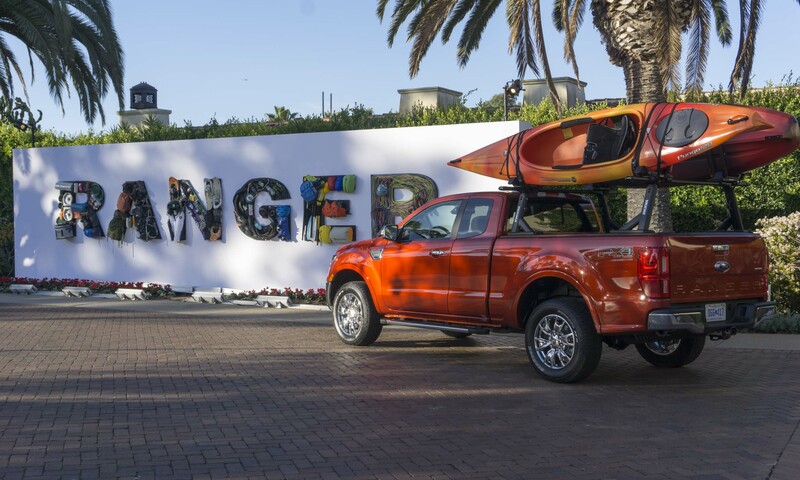 Based on the Ranger pickup sold in more than 100 countries around the world, the 2019 Ford Ranger has been designed and engineered specifically for the North American market. Most truck offerings are quite complex with multiple trims, body styles, drive systems and engines — not so with Ranger. This new midsize truck is available in three trims (XL, XLT, Lariat), two body styles (SuperCab, SuperCrew) and 2WD or 4WD. The SuperCrew runs about $2,000 more than SuperCab, and 4WD bumps up the price about $4,000 over 2WD. SuperCab variants feature a 6-foot bed; SuperCrew versions have a 5-foot bed. 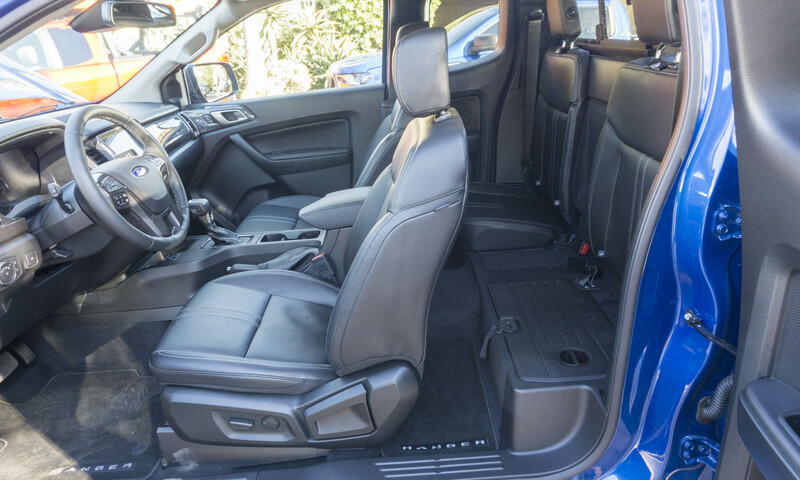 With a starting price of $25,395, the Ranger XL comes with air-conditioning, an AM/FM stereo, a rearview camera, cloth trim, under-seat storage in the rear, four pickup box tiedowns, a locking tailgate and 16-inch steel wheels. The XL is also equipped with automatic emergency braking with pedestrian detection as well as trailer sway control. The Ranger XLT has a base price of $29,035 and upgrades the XL with a carbon black mesh grille, 17-inch painted aluminum wheels, remote keyless entry, a 110 AC power outlet and Wi-Fi hotspot for up to 10 devices. Also standard on the XLT is Ford’s suite of safety features called Co-Pilot360. This includes a blind-spot information system, cross-traffic alert, trailer-tow monitoring, lane-keep assist, pre-collision assist with automatic emergency braking and automatic high-beam headlights. 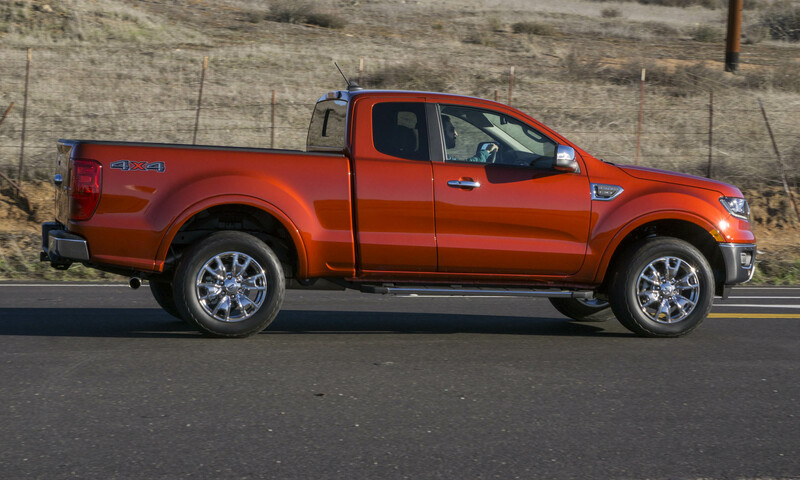 The top-of-the-line Ranger is the Lariat, and it has a starting price of $33,305. 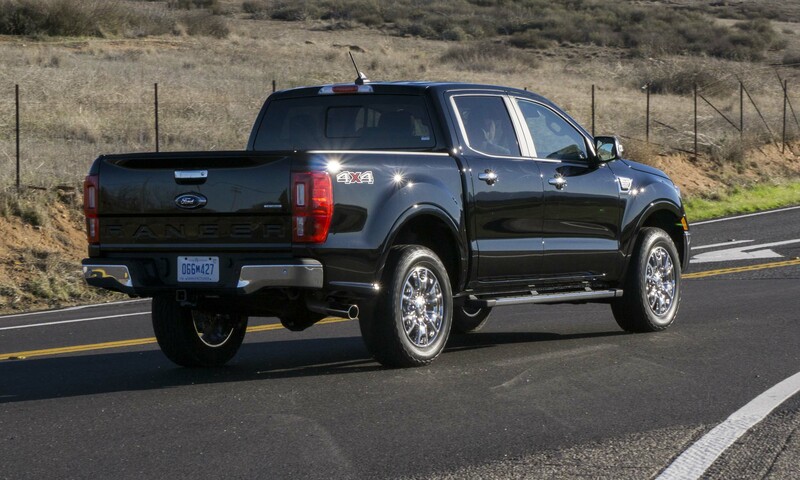 The Lariat upgrades the XLT with dual-zone climate control, leather-trimmed bucket seats, a sliding rear window, 8-way power front seats, heated front seats, ambient lighting, LED headlights and taillights, a chrome bar and surround on the grille, and 18-inch machined aluminum wheels. 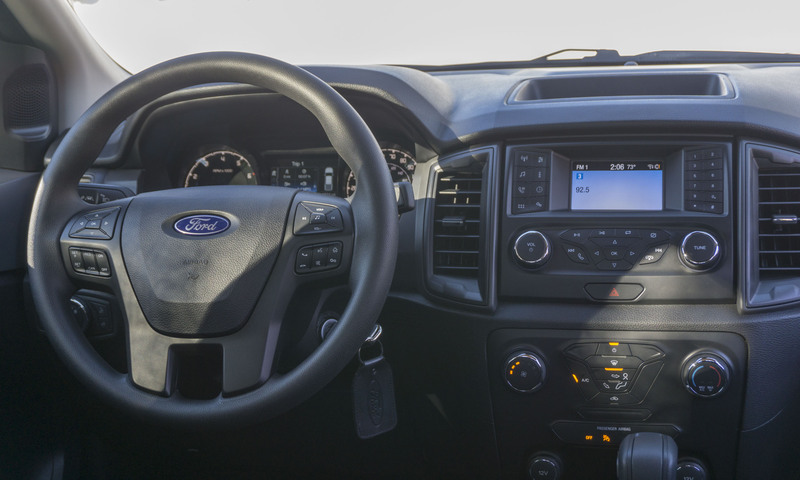 The Lariat also gets SYNC3 which features enhanced voice recognition, an 8-inch touchscreen display, GPS navigation, Apple CarPlay / Android Auto and two USB ports. Buyer can upgrade their Rangers with a spray-on bedliner, running boards, adaptive cruise control, rain-sensing wipers, a variety of wheel options and an STX appearance package that upgrades the look of the XL. 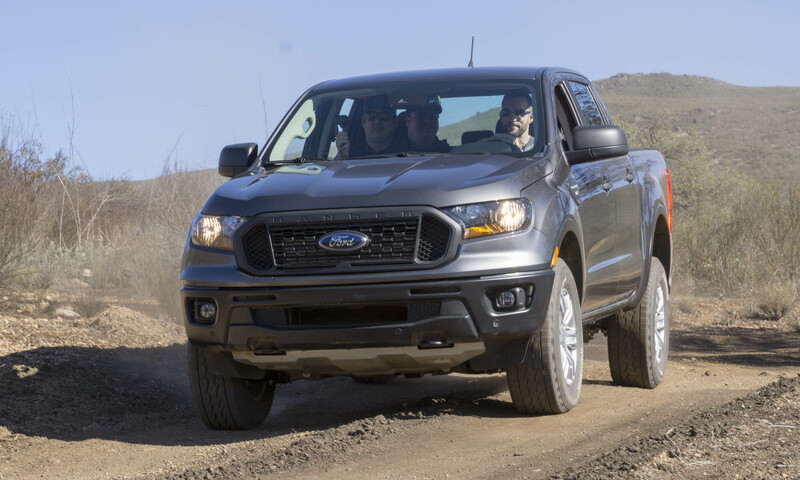 For buyers who plan on heading off-road in the new Ranger, Ford offers the FX4 Off-Road package. Available on all 4WD trims,, the FX4 package adds off-road tires, an electronic locking rear differential, off-road tuned suspension, skidplates, exposed front tow hooks and an off-road display in the instrument cluster. Also included is Ford’s Terrain Management System as well as Trail Control. In keeping with its straightforward model lineup, Ranger stays simple when it comes to powertrain — it has one. All Rangers are powered by a 2.3-liter EcoBoost 4-cylinder engine that produces 270 horsepower and 310 lb-ft of torque. 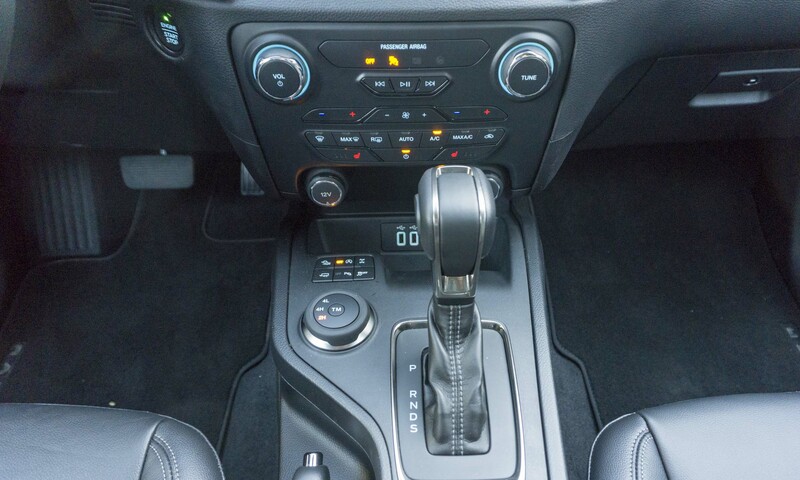 The only transmission available for the new Ranger is a 10-speed SelectShift automatic — no manual is offered at this time. 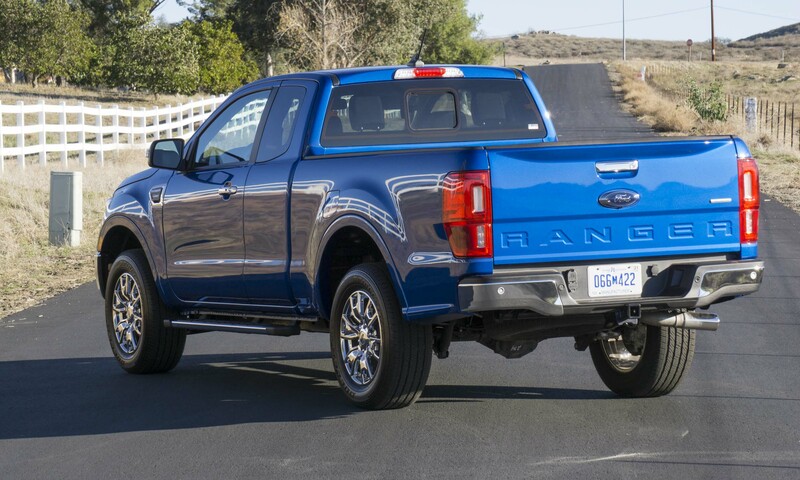 Fuel economy numbers are quite good — in fact, Ford claims that the Ranger is the most fuel-efficient gas-powered midsize pickup in America. Two-wheel-drive trucks are rated at 21 mpg city / 26 mpg hwy / 23 mpg combined. Moving to 4-wheel drive puts fuel economy at 20 / 24 / 22, respectively. 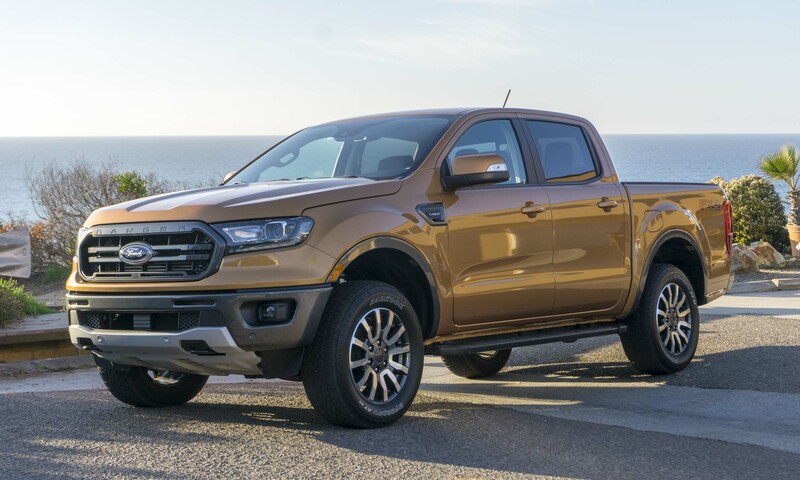 As we have discovered when driving other Ford EcoBoost-equipped products, with the Ranger it is often either Eco or Boost — but not both. A heavy right foot results in excellent performance, but after driving rather enthusiastically in a 2WD Ranger, our trip computer indicated 17 mpg. However, later in the day when we were cruising on highways in the same truck, the information readout indicated 27 mpg. 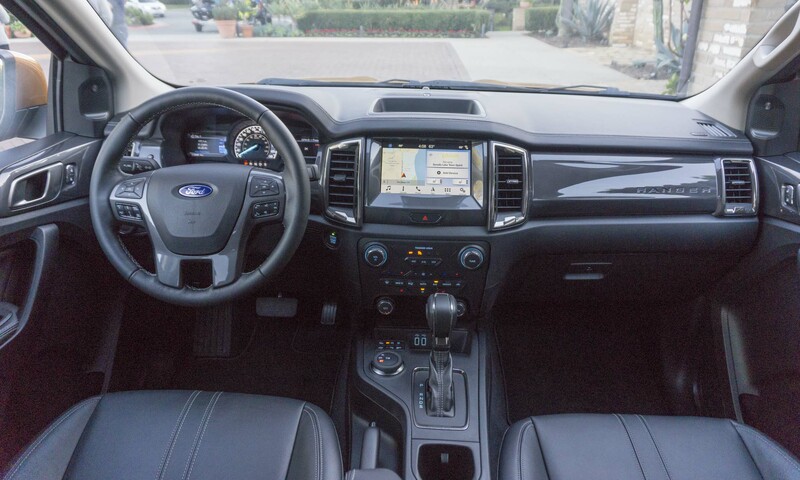 The Ranger interior can range (pardon the pun) from basic in the XL to almost luxurious in the Lariat, but all versions offer a roomy front seat with easy access to controls. Although the XL does not have a large touchscreen display or automatic climate control, buttons and knobs are well executed so audio, climate control and other features are easy to find and use. Upgrading to the larger touchscreen display certainly gives the Ranger a more premium interior. And even though there are no hard buttons to access audio, phone or navigation, the display screen provides a menu at the bottom, and it is one of the best touchscreen interfaces we’ve used. A nice additional touch are lighted USB outlets that are easy to find. Both cloth and leather seat options look good. During our press drive we spent most of the day sitting in the leather-trimmed buckets and found them quite comfortable. The rear seat in the SuperCab is barely a seat. Seatbacks are attached to the rear of the cab in a fully vertical position with no adjustment, and legroom is nonexistent. It would be difficult for an adult to sit in back, even in an emergency. 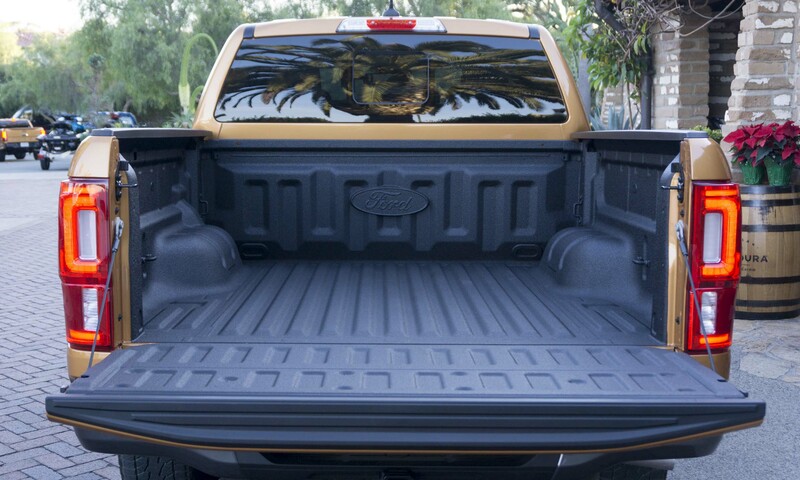 However, the seat cushions are easily removed, and with storage spaces below the area works well for carrying cargo that may not be well suited for being exposed to the elements. The SuperCrew is a proper 5-passenger vehicle with easy access to rear seats that offer a surprising amount of legroom and headroom. 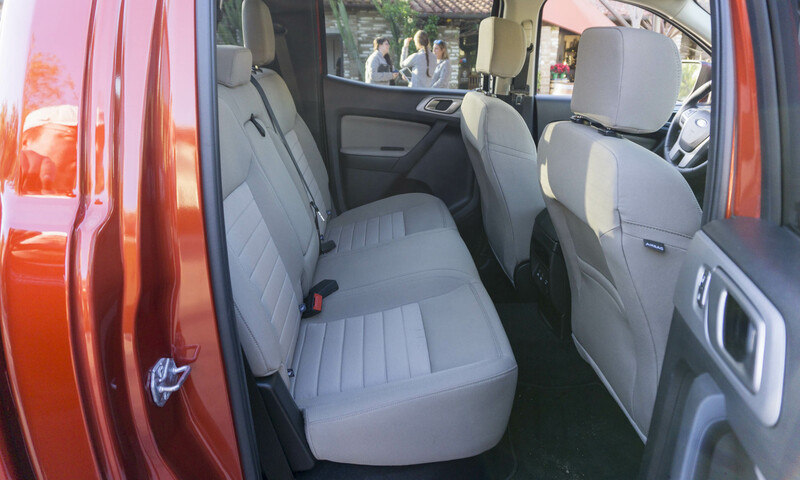 Two adults can sit comfortably in back, and a third would manage without being too cramped. Seats bottoms can be folded up, providing access to additional under-seat storage. When properly equipped, the rear seats also get two USB outlets and an AC 100 outlet. 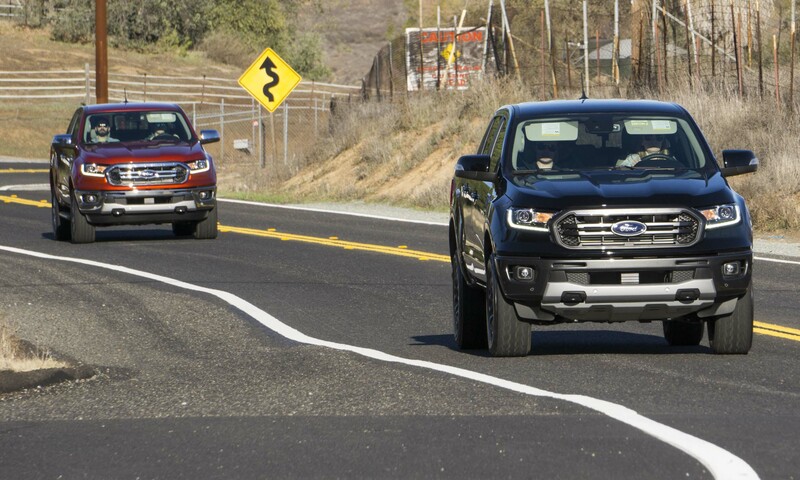 We had the opportunity to spend time behind the wheel of the new Ranger on roads around San Diego, California. 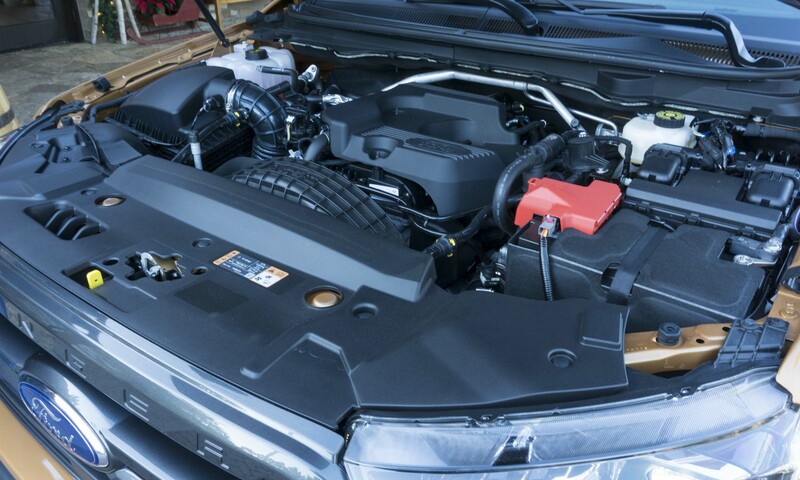 The EcoBoost engine offers impressive performance with strong acceleration available from a stop, as well as plenty of power for easy passing. The 10-speed transmission is impressively smooth — at full throttle when passing a slower vehicle, downshifts are quick and almost unnoticeable. With the bed empty, the 2019 Ranger’s ride is a bit jouncy, even on smooth roads. One might even say it “rides like a truck,” since this is a common issue while driving an empty pickup truck. However, the bouncy ride seems more pronounced in the midsize Ranger than in the larger full-size trucks. 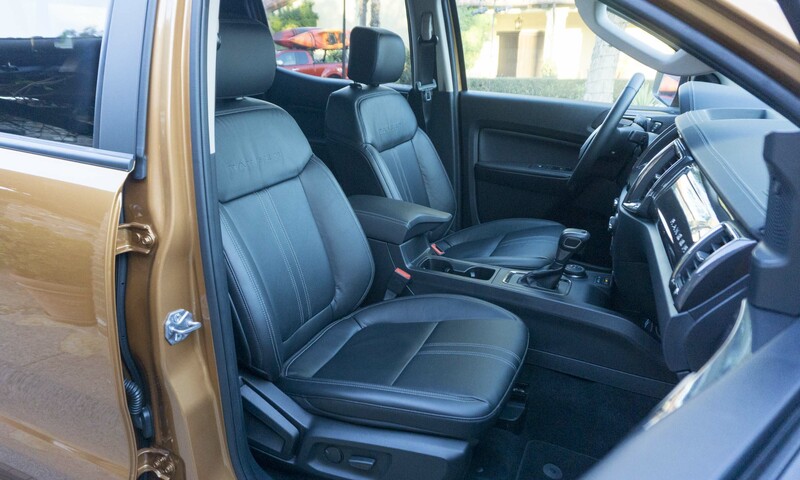 The ride isn’t uncomfortable, but in the Ranger the bumps are quite noticeable. The ride smooths out considerably when on the road in a Ranger with a load in the pickup bed. For part of our drive we had a 405-lb ATV in back. Although not even close to the Ranger’s maximum 1,860-pound payload capacity, having a bit of payload in the back is a common scenario for the Ranger. Even with an additional load, power is more than adequate. Acceleration remains strong with plenty of power on tap as needed. 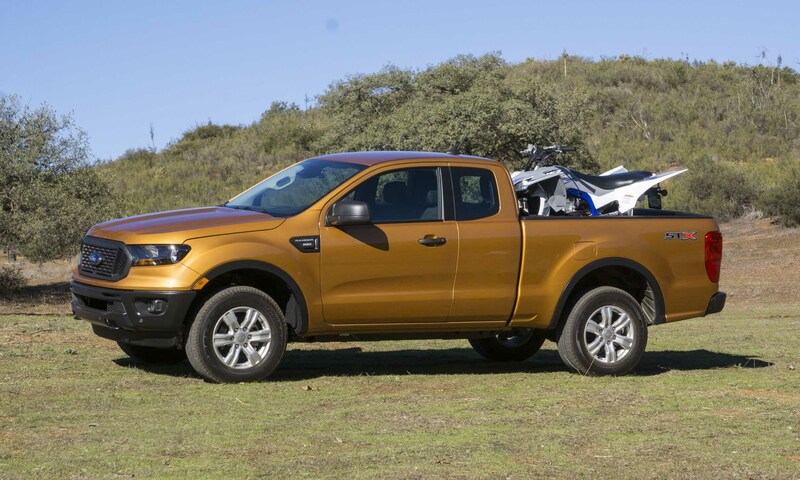 With the same engine / transmission on all trims of the Ranger, every version can be equipped to tow up to 7,500 pounds. The Blind Spot Information System is also adaptable to monitor the longer blind spot created by a trailer’s additional length. Three different trailer profiles can be stored, including the length of the trailer. 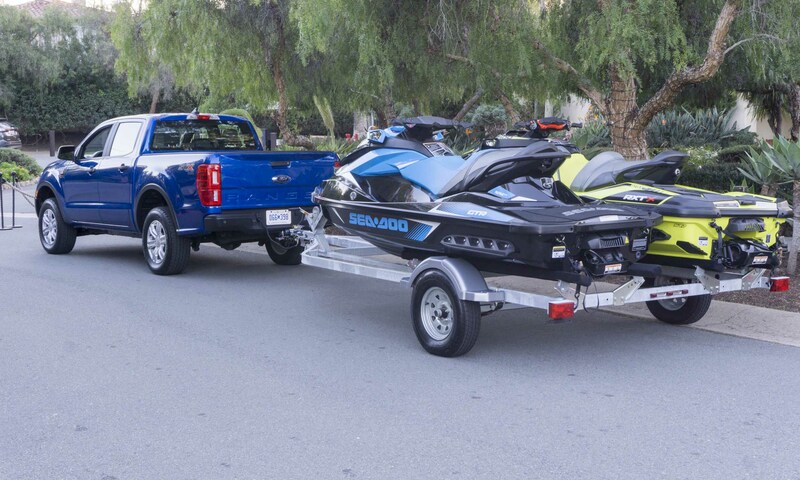 We took a short drive towing two jet skis — well below the maximum tow limit, the Ranger had no problem accelerating up to freeway speeds with the trailer in tow. 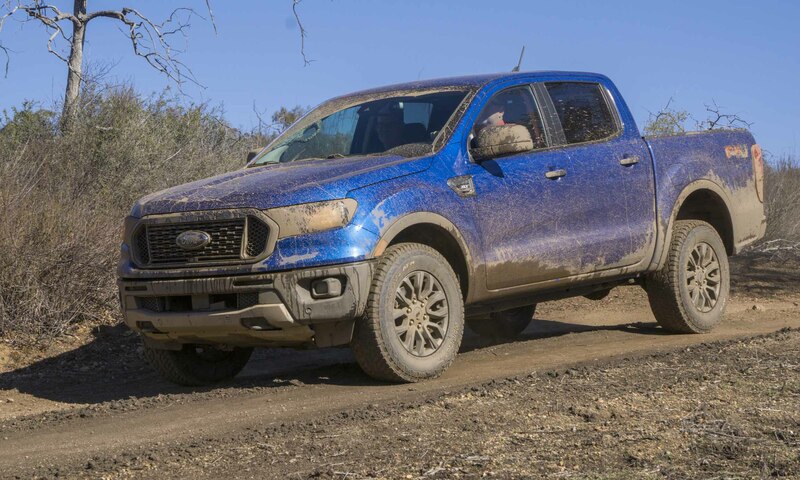 During our press drive, Ford created an off-road playground of sorts to test Ranger’s off-road prowess; and after a few minutes of fun we found the new truck certainly up to off-pavement excursions. Four-wheel-drive Rangers have 8.9-inches of ground clearance, and the 4WD system can be set to 2-high, 4-high or 4-low. With the optional electronic locking rear differential and available off-road tires, the Ranger handles itself well in dirt and mud. Some off-road situations require a slow, steady throttle — in rough conditions when there is a significant amount of interior jostling, it can be hard for drivers to keep from bumping the throttle. 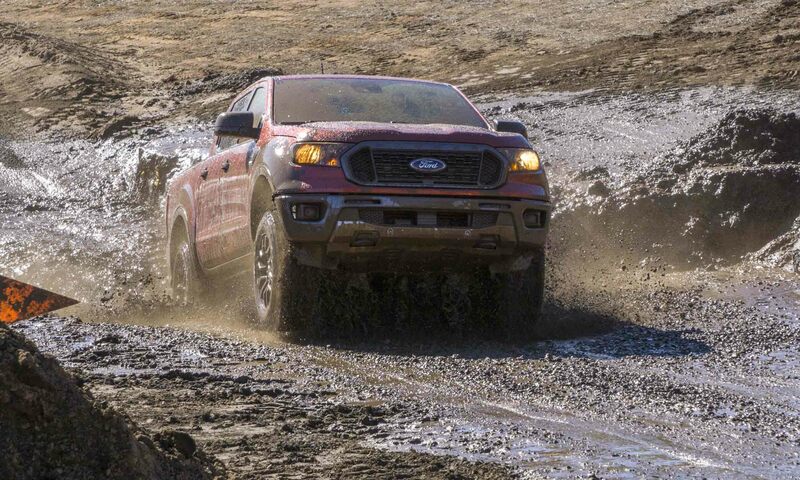 With Ford’s optional Trail Control, the truck can be set to a very low speed and it will automatically direct throttle and braking to individual wheels, so it can smoothly traverse even the roughest terrain. We used Trail Control to traverse some slippery logs and the system worked like a charm, applying power and brakes smoothly as needed. Rangers equipped with the FX4 Off-Road Package get the Terrain Management System, which allows drivers to choose from four driving modes: normal; grass, gravel and snow; mud and ruts; and sand. 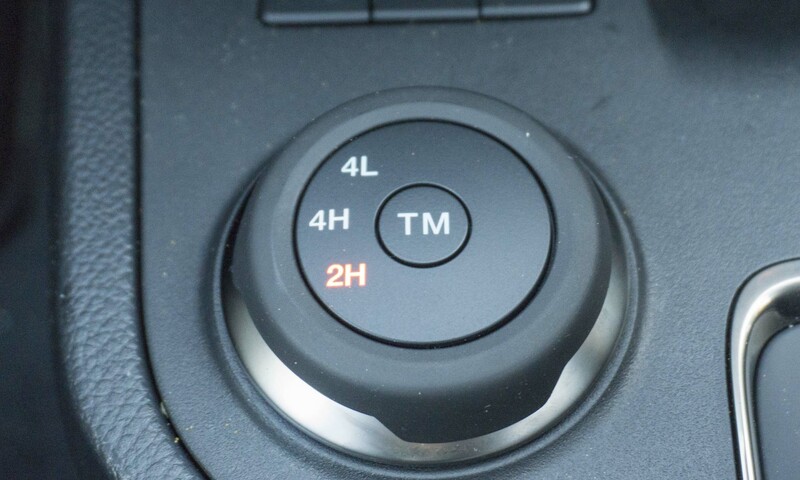 Modes adjust throttle response, shift points and traction control to best function in the chosen terrain. Even with the compact truck market experiencing sales growth, there aren’t many options from which to choose. 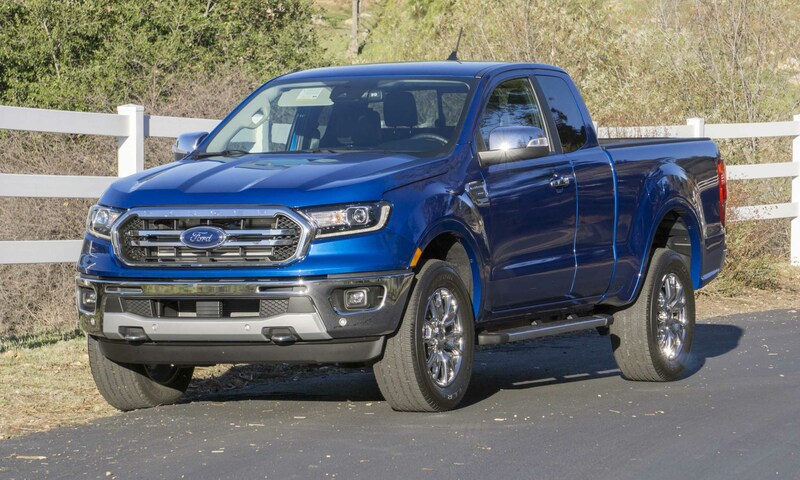 The 2019 Ranger offers the simplicity of a single — but very good — engine / transmission combination in a right-size truck that should meet most consumer needs. 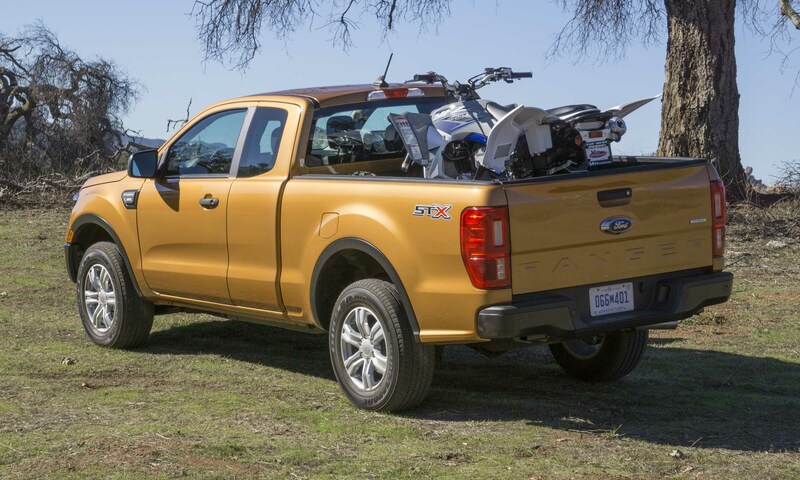 With strong towing and cargo-hauling capabilities, a comfortable interior, off-road capability and attractive styling, the Ford Ranger should easily pick up where it left off eight years ago. Pros: Great value; potent powertrain; versatile size. Cons: Jouncy ride; Extended Cab rear seat unusable; no longbed with SuperCrew. Bottom Line: The fully-capable Ranger should make a big splash in the midsize truck market. 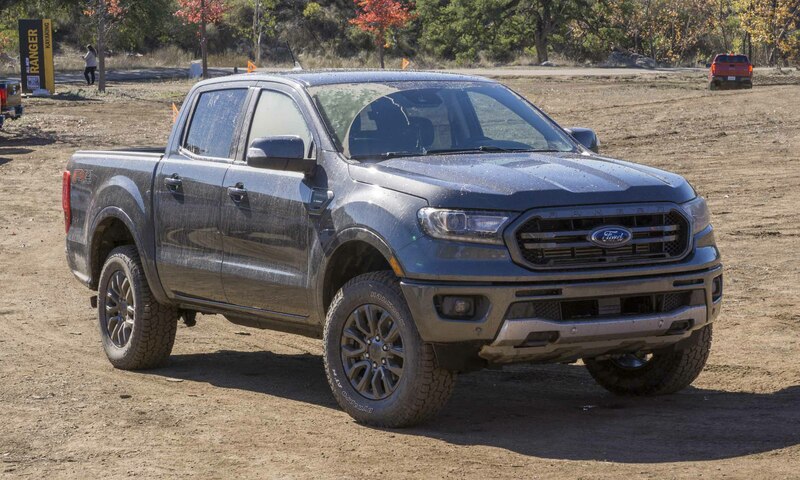 The post 2019 Ford Ranger: First Drive Review appeared first on autoNXT.net.